Born: 1870 in Boston Ma. Died: March 20, 1940 in Bourne Ma. at 69 yrs, 7 mos, 20 d.
1. Abbott Foster Baker; (April 28, 1891 – May 1977); Married Anna F. McLaughlin in Bourne Ma. on October 2, 1917. 2. Mildred W. Baker Tinkham; (June 22, 1894 – February 2, 1973); Married Harry Augustine Tinkham (1894 – 1966) (Omar Augustine Tinkham & Emma L. Ryder) in Bourne Ma. on October 9, 1915; Mildred & Harry are buried next to Harry’s parents in Old Bourne Cemetery in Bourne Ma..
3. 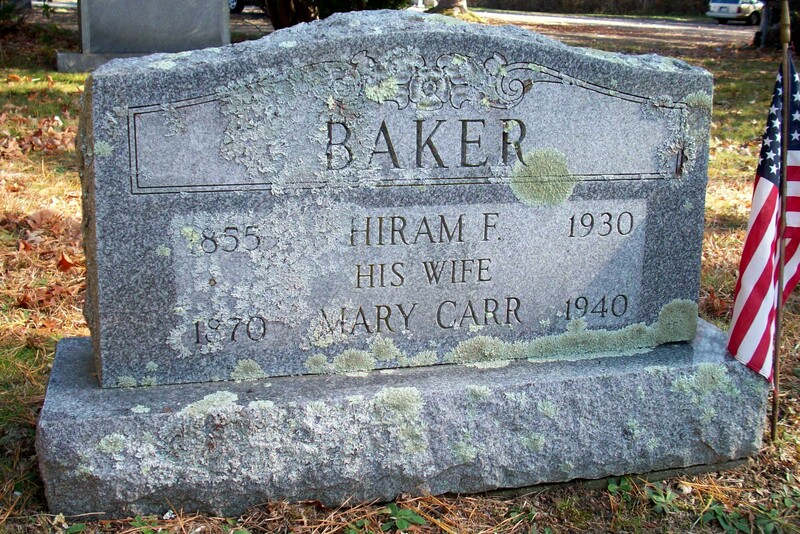 Preston Carr Baker; (January 3, 1907 – 1971); Preston is buried next to his parents in Pocasset Cemetery.